Emirates’ two daily flights from Moscow to Dubai will soon both be served by the airline’s iconic A380. From October 1, 2017, the double daily A380 service will significantly boost seat capacity from Russia to Dubai in order to meet customer demand. 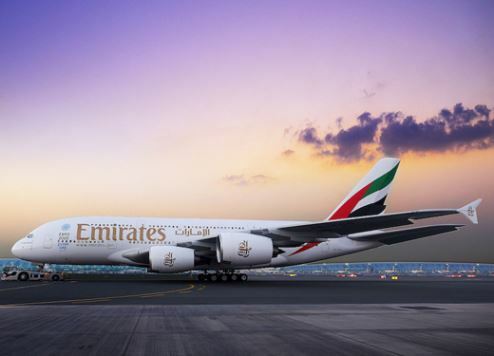 It will also provide Russian travellers with multiple A380-to-A380 connections to a wide range of leisure and business destinations including Bangkok, Singapore, Kuala Lumpur, Hong Kong, Johannesburg, Mumbai, Sydney, Melbourne, Beijing, Shanghai, Tokyo, Taipei and Sao Paolo – all via Dubai. Since Emirates launched flights from Dubai to Moscow in 2003, the airline has carried more than four million passengers on the route. This aircraft upgauge represents an increase of more than 1,000 seats per week on the route and demonstrates Emirates’ commitment to the Russian market, further supporting tourism and trade links between the Middle East and countries connected by the vast Emirates worldwide route network and Russia. Flights EK131/132 and EK133/134 will be operated by an A380 aircraft in a three-class configuration with 14 Private Suites in First Class, 76 flat-bed seats in Business Class and 427 comfortable seats in Economy Class. In all cabins passengers will enjoy access to Wi-Fi and more than 2,500 channels of films, music and games, more than 60 in Russian, through ice Digital Widescreen, Emirates’ award-winning inflight entertainment system. Premium customers are also offered complimentary Chauffeur Drive services to and from Moscow Domodedovo Airport and Dubai International Airport, access to Emirates’ exclusive lounges across select airports around the world and priority check-in. Emirates has also made amendments to its winter schedule to and from St Petersburg. From October 29, 2017 until March 24, 2018, EK176 will depart from Pulkovo International Airport at 23:55hrs and land at Dubai International Airport the next day at 07:05hrs. From Dubai, EK175 flight will depart at 15:30hrs and land in Saint Petersburg at 20:45hrs. The new times will enable Russian visitors to Dubai an additional day in the city, arriving from Saint Petersburg early in the morning instead of late evening. Given Russian customers can now receive a free UAE visa on arrival, the new schedule opens up even more opportunities to explore Dubai.